In Suntec Singapore, a new kind of space for events and exhibitions has become a reality after modernisation plans were changed back and forth. The new space takes the concept of customisable exhibition spaces to the next level. Situated in the central business district of Singapore, Suntec Singapore Convention and Exhibition Centre is Singapore’s venue of choice for meetings, conventions and exhibitions. For Suntec Singapore, plans to renovate date back to 2010. Back then, Suntec Singapore had a clear vision of an advanced lighting solution for the fourth level, entailing some form of LED video. As the existing products in the market were unable to match Suntec Singapore’s expectations, renovations began with a different plan in mind. 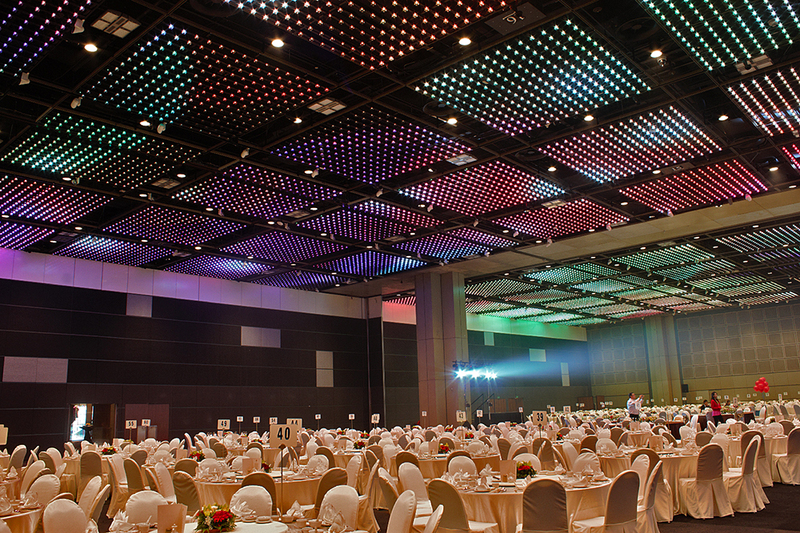 However, when Bo Steiber Lighting Design introduced Suntec Singapore to Martin VC-Dot 1, the project took a different turn. Suntec Singapore takes pride in being an industry trendsetter in using cutting-edge technology. The overall goal is to implement technology that improves business for both Suntec Singapore and its clients. Also, Suntec Singapore’s ambition was to minimize its carbon footprint by replacing as many lights as possible with LED technology. Incorporating the ceiling into the design is an innovative way of using a portion of the hall which is normally ignored. Because of this, Suntec Singapore can now instantaneously change the whole mood of the space. Everything is programmable and can be controlled centrally, so there is no need for staff to climb the ceiling in order to make adjustments. The result for Suntec Singapore means that it now has a much more flexible, marketable and efficient event space. The ceiling covered in LED VC-Dot 1s has become a showpiece in itself. It brings new business potential in terms of the types of events Suntec Singapore is now able to offer its clients and the flexibility it is able to provide for a single space. Now it is possible for customers to differentiate themselves by adding logos, messaging and graphics to their event and incorporating this into the ceiling space.